This renowned law firm in Chicago needed a communications system that offered reliability, helped manage costs and offered easy administration to help them get the most value from their solution. Best, Vanderlaan & Harrington is a firm of trial attorneys with a reputation for excellence and dedication to their clients. Their partners rank among the best attorneys in the country by peer nomination and their clients are drawn to their success and dedicated attention. To maintain their reputation, they needed to be accessible and have a communications system that worked reliably. 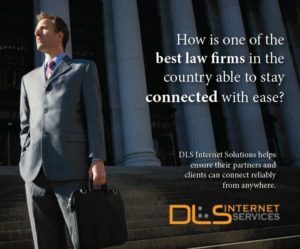 They chose DLS to help them reach attorneys no matter where they are, provide reliable connectivity with clients and receive critical fax and office email information from their mobile devices. “We like the flexibility of their PBX phones to make remote phone deployment easy with regular updates of the PBX software to add or tweak features that we need. It helps to have voicemail recordings sent to my email nearly instantly upon being left and having the ability to forward phone calls to cell phones, another extension, etc.,” said Matthew Hargrave, a partner with the firm. Another key factor in their decision was DLS’s reliability and service. An in-demand, professional firm cannot afford to miss a call or lose access to important information because of disrupted service. Poor reception and call quality are also key concerns that needed to be mitigated by their service provider. Service, quality and reliability enable DLS to play a key role in helping this law firm sustain a professional image in the competitive professional landscape. ← Is Your Company’s Data in Good Hands?